The DC-4Q series of drives are DC in/DC out PWM chassis drives capable of four quadrant reversing and braking. This series of drives is ideal for portable battery powered equipment. The DC-4Q has the ability to maintain variable speed even as battery decreases and has a sleep mode for extended battery life while not in use. The four quadrant capability allows simple connections for fast reversing and/or braking without the need for bulky contactors or braking resistors. 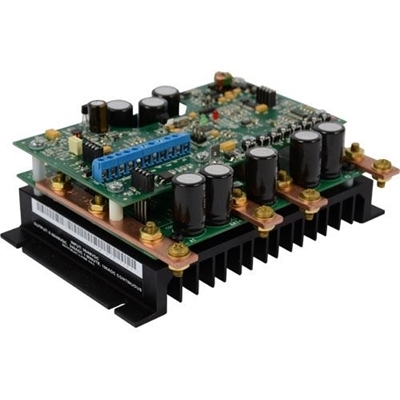 The 1.01 form factor produces clean DC output for efficient and quiet motor operation. Like all Minarik Drives products, these units are built in the USA. The DC-4Q series of drives have adjustments for IR Compensation, Motoring Current Limit, Regenerative Current Limit, Forward Max Speed, Reverse Max Speed, Min Speed, Deceleration and Acceleration Time. These drives are microprocessor based meaning these ranges can be reprogrammed to meet any custom needs. The DC-4Q series also has Power and Fault LEDs, including current limit, under voltage, overheat and short circuit. The DC-4Q is available in two models, one for 12-24V systems, the other is designed for 36-48V systems. For simplicity and safety, no jumpers or switches are required for selecting voltages. * Derate by 20% when mounted horizontally. Four Quadrant Control: Simple reversing and braking via a switch closure to the drive. High Continuous Current: Up to 120 Amps continuous, robust bus bars used to handle the current. Max One Min. Peak Current: 240 Amps. Output 100% of DC Input: Compared to 90% output of similar units on the market. Short Circuit Protection: Unit protects itself against a shorted motor. Sleep Mode: Extended battery life. On Board Calibration: Calibrate using on board non-interactive trimmer pots, no programming or additional accessories are needed. Inhibit Circuit: Convenient for remote starting and stopping. 1.01 Form Factor: Clean DC output for efficient and quiet motor operation at a 16 kHz PWM frequency. Fan Accessory: Optional field installable fan kit increases continuous current rating at 160 Amps. Precharge Circuit: Optional contactor can be used to provide soft starts and protection against runaway. LED Outputs: Power, Current Limit, Under Voltage, Over Voltage, Overheat and Short Circuit. Temperature Sensor: Current limit automatically reduced if controller heats up.